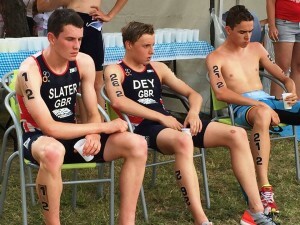 City of Salford swimmer Marcus Dey has just returned from Tiszaujvaro, Hungary where he spent 9 days with the Great Britain Under 18’s Triathlon team on a warm weather training camp culminating in the ETU European Elite Youth Triathlon Championships. The team comprised of 8 members (4 boys,4 girls) and Marcus qualified for the team when he excelled in The European Trials at Hetton Lyons earlier last month. At the age of 15 Marcus was the youngest boy, incredibly qualifying 2 years under age. 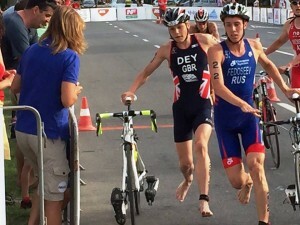 The competition included 20 European countries participating with 94 of the best under 18’s Youth Triathletes in Europe. The format of the competition saw the athletes race in three semi- finals (approx 30 in each race) on Saturday 2nd July. The distances involved were a 500m swim in a small man-made lake in the town followed by a 12km bike ride and a 3km run. The first 9 in e ach semi final and the fastest three losers meant automatic qualification to the European Youth final held on the Monday Evening 4th July. Marcus started the semi final coming out of the swim with the lead pack and entering transition in first place. Cycling comfortably with the lead group of riders he unfortunately had a collision with an Italian athlete who accidentally clipped his back wheel causing him to fall. After recovering and quickly resetting his wheel he rejoined the race which cost him about a minute but he found himself in between the lead group and the chasing pack. 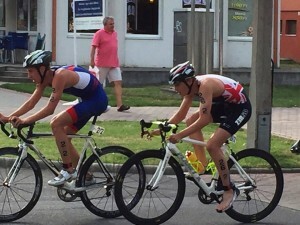 This meant that Marcus effectively had to time trial the bike leg on his own to the run transition phase. He began the run in a nervy 7th place and boldly held this position to eventually qualify for the final – a great effort considering the time lost due to the collision. The final was to be over longer distances of 500m swim, 12.6km bike and a 3.6km run which Marcus was not familiar with and along with the 30 degree heat to contend with – it was going to be tough. Great Britain had all four boys qualify for the final which featured the top 30 athletes in Europe. Once again Marcus had a good swim coming out of the water and into transition with the lead group of about 6 athletes. The lead group rode well and were to cover 5 laps around the town however it soon became apparent that the chasing pack of about 13 riders were catching the lead group. On the second lap Marcus launched an attack to try and maintain the lead, unfortunately nobody in the lead group went with him and they were caught by the chasing pack which meant that 18 athletes bunched together coming into the transition phase. It should be noted that the lead pack maintained an incredible average speed of 25 mph during the 12.6 km. Marcus was the first GB athlete out of transition into the run leg where he now three laps. He held it together for the first lap but started to tire over the second and third lap losing ground. He finished the race in 14th and was the third GB athlete to finish but impressively he was the fastest 15 year old in Europe. The distance was the longest race Marcus had participated in, he performed remarkably well racing in an elite European field two years above his age group impressing the coaches and support staff of the GB team. Encouragingly he is eligible to race in this competition for the next two years.